Being an allergy parent isn’t just about what your child eats. It’s about navigating the minefields that everyday life throws up. 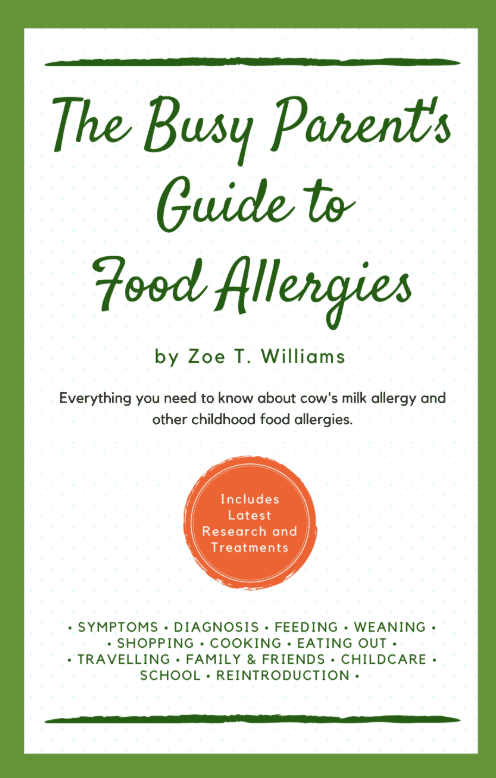 Whether your child has cow’s milk allergy, nut allergy, or other food allergies, this book will guide you through the key issues you will face. Available now on Amazon in paperback – Kindle edition coming soon. Starting solids, finding childcare, going to school, family holidays, enjoying a meal in a restaurant, birthday parties and family gatherings. All these aspects of childhood we often take for granted come with additional challenges when you have a child with food allergies. Our children appear well to the outside world and the problems remain invisible – which means parents often end up facing these issues alone. You simply cannot imagine what it is like to be responsible for a child with food allergies until it affects you. Each chapter focuses on a particular issue and offers suggestions on how to tackle it, so that you can dip in and out of it over the years. Some chapters are also handy to share with grandparents or anyone else who may be looking after your child. 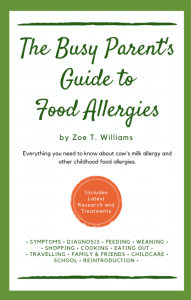 Zoe has written a really informative book that everyone who has any involvement with a food allergic person should read! 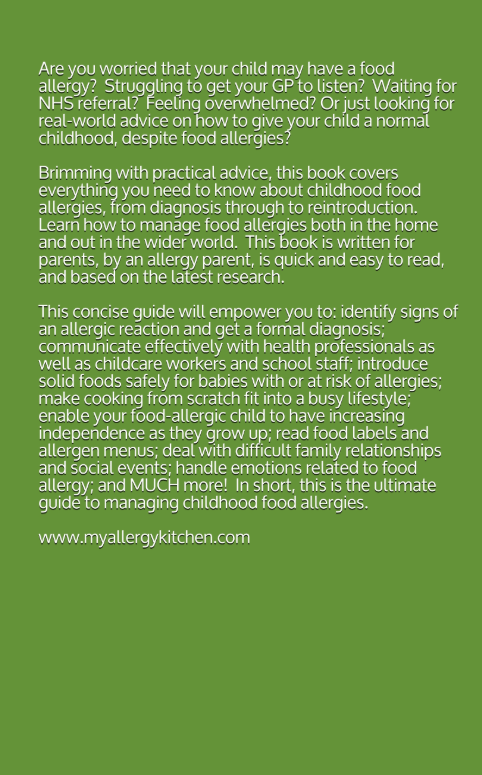 It provides practical tips for the day to day management of food allergies, and could be an invaluable resource to help parents/carers navigate their way through living with food allergies. Such a useful resource! It’s brilliant. It covers all aspects of food allergies [from] what they are, the testing that can be done … but also practical things like going out to eat, reading food labels, how to navigate travelling and once they’re at school and university … I would really recommend it. Dr Stephanie Ooi, GP and allergy mum. I see so many breastfeeding families struggling with the idea of potential allergies and intolerances and what to do next. There’s been a real gap in accessible literature for families to get constructive information and support. [This] book fills the void! It’s a step by step guide to working out what the issues are, how to deal with them, and most importantly how to not let it absorb every ounce of your energy. I’m sure with [this] book in hand a parent of a child with allergies will feel greatly empowered and supported, [Zoe’s] tone in the book is realistic and yet upbeat and hopeful. Something that will be so helpful to families who are contemplating making big diet changes for their child and them. Informative but also accessible and supportive … this will be a very useful book. Can’t quite describe how spot on this book is! I mean there’s nothing missing, everything is covered and in such a great way. Medical terms are used but also explained so well. I wish this was around 4 years ago when [my son] was a baby because life for us all would have been easier! All I can say is I wish this book had been around when we began our journey into food allergies 10 years ago!!! It is packed with useful information that is clear and concise and the style of writing is very personal and easy to read. Even though we have been living with allergies for 10 years this book contains a lot of research and information that I was unaware of and the chapters on allergies and the teenage years onwards were particularly useful to me. I think this book should be given to every newly diagnosed allergy parent as part of their child’s care plan. This is a time of great fear and uncertainty and this book helps to quell those fears and gives you a sense of support. Simply enter your email address and receive a sample chapter to your inbox, along with Zoe’s personal story of having a baby with multiple food allergies.